Distribution centers need to label variable sized cartons at ever increasing line speeds with accurate shipping information. And they need that labeling system to be reliable and cost-effective. Do your demands include product traceability, quality assurance, tracking and tracing in logistics or individual identification of products for just-in-time production? Weber has the answer. Weber’s new LA-6000 high-speed variable-height print-apply system will label passing cartons of varying heights quickly, accurately and efficiently. The servo motor driven actuator will ensure label application at up to 2250 cycles per hour depending on label size. Carbon fiber components reduce the weight of moving parts for higher labeling speeds. And with the LA-6000's modular design and large 13.8" O.D. 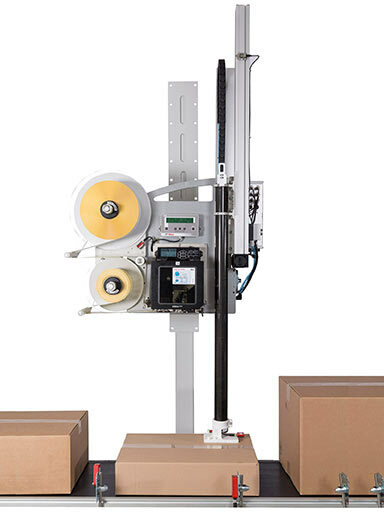 label rolls, you can print and apply labels with a minimum of downtime. Using the tamp-blow method, theLA-6000 can print and apply up to 40 labels per minute (dispensing output depends on label size, text change and dispensing stroke) to products that vary in height up to 19.68” (500mm). And label placement accuracy is ±0.03” (1mm). • Interchangeable dispensing heads allow the use of different label sizes. • Peak performances is achieved using a servo motor driven dispensing applicator and carbon fiber construction. • The LA-6000 will handle large label rolls with an ergonomically adjustable reel holder taking maximum roll size of up to 13.7” (350mm) in diameter. A sensor initially determines the height of the approaching product for labelling and then the applicator moves to the correct position at high speed. This reduces the travelling distance for label application, allowing theLA-6000 to simultaneously label more accurately and up to 50 percent faster than a label printer-applicator with a pneumatically driven cylinder. The newly redesigned microprocessor controller is compact and facilitates easy integration into existing operating environments. 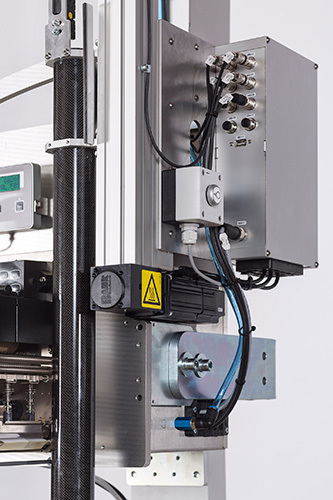 The system’s modular construction allows easy access to components for servicing and or maintenance, enabling convenient changing of labels and ribbons as well as easy cleaning of the print module’s thermal print head. The LA-6000 variable-height tamp-blow print-apply system includes a number of noteworthy features that add to the operational versatility of this printer-applicator. • Tamp-blow application. This is a very popular method of air-assisted label placement used with standard applications, and is particularly useful in the labeling of recessed areas. A printed label is fed onto a tamp pad and held by vacuum, a servo-powered cylinder extends to within .25 inch of the product, and the label is blown onto its surface to a placement accuracy of 0.03".